What is Zendio Email Tracking and Analytics Software? 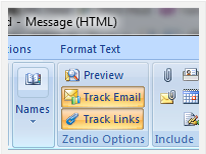 Zendio is an Outlook plugin that lets you know what happens after you hit the send button. Zendio is easy to use. Unlike traditional Microsoft Outlook read receipts, you don't have to take any additional steps when you send your emails, and your recipients don’t have to click anything to trigger the email delivery confirmation. Simply install Zendio and it takes care of everything automatically. Stop following up emails with phone calls that begin with "I'm just calling to see if you got my email..."
With Zendio’s email tracking software, you get notified you as soon as the recipient reads the email you sent. Then simply decide what to do next: follow up, wait for a response, or just cross it off your to-do list, knowing the message was delivered and read. Get separate link notifications when links Included in your email are clicked. How many times have you included an important link in an email and wanted to know if it was clicked? Now when your recipient clicks on any link you include, Zendio will send you a notification. Knowing your recipient read all of the information you provided lets you know where to start the next conversation. 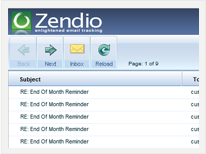 Access to the Zendio Tracking Inbox provides you usable data about your emails. Over time, you’ll know who opens emails right away, who tends to read email at the end of the day, and who is usually a few days behind in reading their emails. 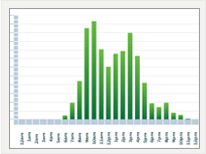 Knowing what time of day your contacts most often read your emails and how long it usually takes to get to it, provides you the data you need to make better business decisions. 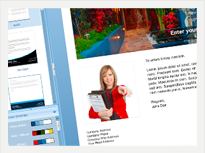 Your print materials are branded, why not your emails? With the Zendio stationery creator you can create custom, branded email stationery using one of our totally customizable templates and footer styles. With the Zendio stationery your graphics will not show up as attachments, so you don’t need to worry about the graphics getting blocked by SPAM folders. Now you can easily promote your brand with each email that you send. Unlike other email analytics and tracking software, your emails never pass through our servers. Simply put that means we don't have to see or store your email.